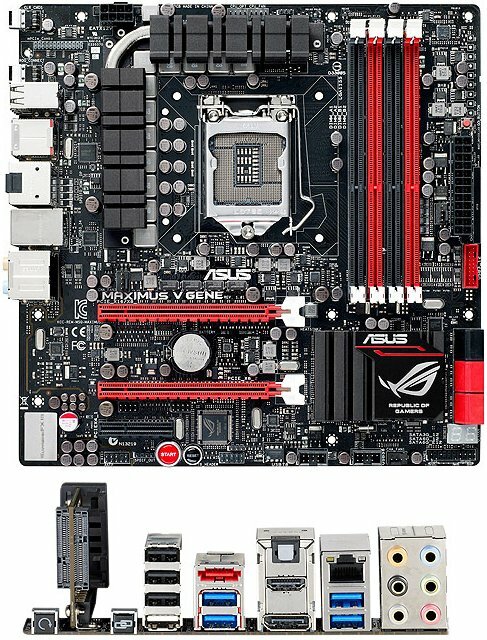 Now in its fifth generation, ASUS ROG (Republic of Gamers) has launched its Maximus V Series motherboards with the Maximus V GENE. This micro-ATX powerhouse is built using the latest Intel® Z77 chipset, which supports Intel’s latest LGA1155 processors. Featuring full PCI-Express Gen-3 capabilities with Intel’s® 3rd Generation processor the Republic of Gamers team equips the Maximus V GENE with exclusive features such as the Extreme Engine DIGI+ II™ power control design, SupremeFX III™ gaming audio, Intel® Ethernet with ROG GameFirst software and the newly added mPCIe Combo™ card. The mPCIe Combo card is a new innovation by the ROG team, combining the twin functions of mPCIe with mSATA into a single, extensible add-in card that still allows full use of the PCI-Express slots for multi-GPU graphics. Use an mSATA SSD with Intel’s® Smart Response Technology to greatly improve hard-drive performance or as an ultra-fast OS drive to free up standard SATA ports for other uses. The combination of a standard mPCIe socket on the other side allows unique upgrades such as WiFi, Bluetooth, 3G/4G, GPS and other connectivity options. The Maximus V GENE is true to the Republic of Gamers core, as a motherboard built for overclocking. Do not accept imitations or compromise with first generation digital designs. The upgraded Extreme Engine DIGI+ II™ includes a 8+4+2 (CPU, iGPU, DRAM) phase design offers the best in precise digital power control from two DIGI+ controllers. Combined with class leading ROG UEFI BIOS functions, such as the new pre-configured memory IC profiles, specially sourced electrical components and industry first trace designs the Maximus V Gene yields an unmatched overclocking experience for enthusiasts. Designed to bring gamers the best possible integrated audio, the SupremeFX III™ sound is a wholly separate audio PCB, identified by its ‘redline’ adjoining the main GENE V motherboard. SupremeFX Shielding technology maximizes the audio quality by further isolating the audio processing from EMI, encasing the chipset under a custom aluminum cap. Combined with a large 1500uF buffer capacitor to provide sufficient energy for even the loudest sounds, SupremeFX III™ attains a lossless audio of up to 110dB SNR. The addition of X-Fi Xtreme Fidelity, EAX Advanced HD 5.0, Creative Alchemy and THX TruStudio PRO complete the lineup of audio technologies that offer an incredibly immersive gaming experience. Intel® Ethernet and ROG GameFirst software combines up to 35% saving in CPU usage with network traffic prioritizing, while LucidLogix Virtu MVP support enables a new hybrid graphics mode that boosts overall GPU performance by up to 60%. For more detailed information, please visit http://rog.asus.com. Product specifications and features may change without prior notice. CPU Intel® Socket 1155 for 3rd and 2nd Generation Intel® Core™ Processors.